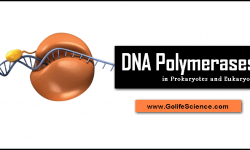 Tertiary Structure of Proteins: What is the role protein? The tertiary structure of protein definition is to the arrangement of amino acid side chains in the protein. Generally, the information for protein structure is contained within the amino acid sequence of the protein itself. This important principle of biochemistry was first determined by the biochemist “Christian Anfinsen” in studies of the enzyme Ribonuclease. 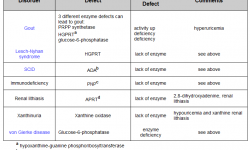 Isoenzymes are Special Proteins with Catalytic activity. Why? Ribonuclease catalyzes simple hydrolysis of ribonucleic acid. This is one of the classical examples of the tertiary structure of the protein. The native enzyme has 124 amino acids; 8 of these are cysteines, forming 4 disulfide bonds. 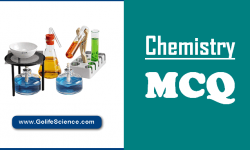 When ribonuclease was treated with mercaptoethanol to destroy the disulfide bonds and urea to disrupt its secondary and tertiary structure of the protein, all enzymatic activity was lost. Physical methods showed that this denatured form of ribonuclease had lost all detectable secondary and tertiary structure, although its amino acid sequence (primary structure) was intact. Anfinsen then slowly removed the urea and mercaptoethanol, then exposed the solution to air to re-oxidize the cysteine pairs to disulfides. The renatured enzyme had full activity, leading to the conclusion that all the information required for the enzyme’s three-dimensional structure was present only in the linear sequence of amino acids it contained and that the active structure of the enzyme was the thermodynamically most stable one. 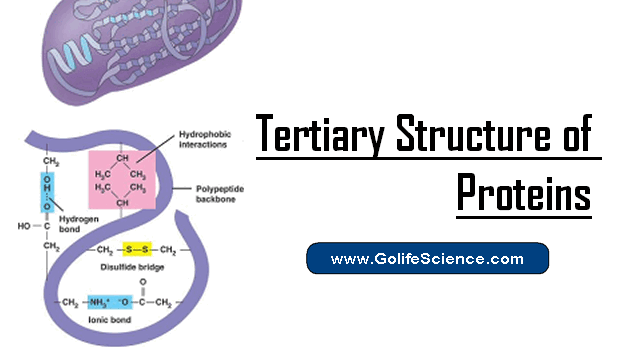 Why is the Tertiary Structure of Proteins important? The third type of structure found in proteins is called the tertiary structure of the protein. The tertiary structure is the final specific geometric shape that a protein assumes. This final shape is determined by a variety of bonding interactions between the “side chains” on the amino acids. 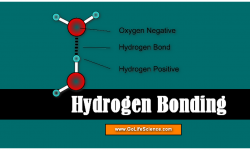 These bonding interactions may be stronger than the hydrogen bonds between amide groups holding the helical structure. As a result, bonding interactions between “side chains” may cause a number of folds, bends, and loops in the protein chain. Different fragments of the same chain may become bonded together. There are four forces that stabilize the tertiary level of proteins between “side chains” including hydrogen bonding, salt bridges, disulfide bonds, and non-polar hydrophobic interactions. Salt bridges result from the neutralization of an acid and amine on side chains. The final interaction is ionic between the positive ammonium group and the negative acid group. Any combination of the various acidic or amine amino acid side chains will have this effect. The example on the left is the prion protein with the salt bridge of glutamic acid 200 and lysine 204. In this case, a very small loop is made because there are only three other amino acids between them. This salt bridge has the effect of straightening an alpha helix. 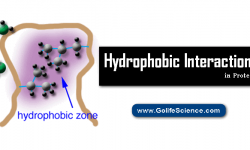 Hydrophobic interaction definition is the relations between water and hydrophobes (low water-soluble molecules). Hydrophobes are nonpolar molecules and usually have a long chain of carbons that do not interact with water molecules. 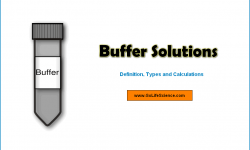 The mixing of fat and water is a good example of this particular interaction. The common misconception is that water and fat don’t mix because the Van der Waals forces that are acting upon both water and fat molecules are too weak. However, this is not the case. The behavior of a fat droplet in water has more to do with the enthalpy and entropy of the reaction than its intermolecular forces. The hydrophobic interactions of non-polar side chains are believed to contribute significantly to the stabilizing of the tertiary structure of proteins. This interaction is really just an application of the solubility rule that “likes dissolve likes”. The non-polar groups mutually repel water and other polar groups and result in a net attraction of the non-polar groups for each other. Hydrocarbon alkyl groups on ala, val, leu, and ile interact in this way. In addition, benzene (aromatic) rings on Phenylalanine and tyrosine can “stack” together. A mutation in the gene encoding a protein is a frequent cause of altered tertiary structure. Familial hypercholesterolemia is caused by failure of mutant low-density lipoprotein (LDL) receptors to reach the plasma membrane. Osteogenesis imperfecta is caused by the failure of mutant Type I collagen molecules to assemble correctly. Mutant proteins may aggregate forming insoluble, nonfunctional deposits. This is particularly likely if the mutation causes hydrophobic R groups to be displayed at the surface of the molecule rather than in its interior and/or triggers the formation of the beta conformation in a formerly-soluble protein. Insoluble aggregates of any protein dominated by beta conformation are called amyloid. Bovine spongiform encephalopathy (BSE) “mad cow”) disease and the human version — Creutzfeldt-Jakob disease (CJD) — are characterized by amyloid deposits in the brain of a mutant version of the prion protein. The normal protein has lots of alpha helical regions and is soluble. In the mutant version, the alpha helix is converted into beta conformation and the protein becomes insoluble. Curiously, tiny amounts of the mutant version can trigger the alpha-to-beta conversion in the normal protein. Thus the mutant version can be infectious. There have been several cases in Europe of people ill with Creutzfeldt-Jakob disease that may have acquired it from ingesting tiny amounts of the mutant protein in their beef. A number of other proteins altered by a point mutation in the gene encoding them, e.g. : fibrinogen, lysozyme, transthyretin (a serum protein that transports thyroxin and retinol (vitamin A) in the blood) can form insoluble amyloid deposits in humans. The many hydrogen bonds that can form between the polypeptide backbones in the beta conformation suggests that this is a stable secondary structure potentially available to many proteins and so a tendency to form insoluble aggregates is as well. Avoidance of amyloid formation may account for the large investment in the cell in chaperones and proteasomes as well as the crucial importance of particular amino acid side chains in maintaining a globular, and hence soluble, tertiary structure.